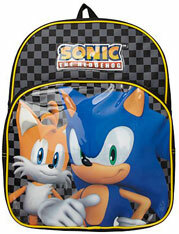 Even though school can be annoying, school supplies is still a fun catagory for Sonic. 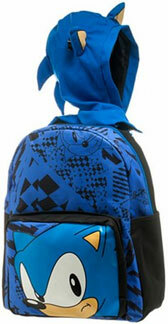 There are lots of neat Sonic theme things that can be done with school supplies. Plus, nothing says you have to use these for school work! Making Sonic arts & crafts, and using them to store other Sonic items are also good ideas. 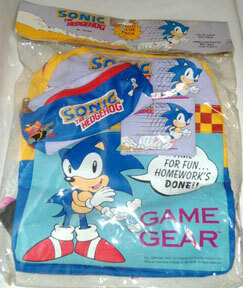 Many of the items make organizing your Sonic collection neater or easier. The UK, while not having as much in the way of school theme stuff like Japan (but in the area of skool...Japan is nearly invincible stuff-wise) still turned out a nice selection. Most of these things are modern. If you see any classic items (true oldies) you'll need Ebay to find those. This is called "Value Pack Bag". That's what it says in the little orange sunburst at the top. It's a clear sack with 2 bags inside for school. 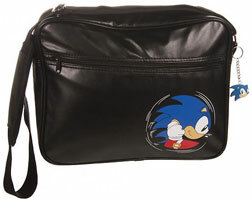 The first is a schoolbag (Though not as big as a traditional one) with running Sonic at the top, checkered band, and clapping Sonic at the bottom. He says "Time for fun...homework's Done!!" as he claps near the Game Gear logo. The second bag is a hip pack/belt bag/fanny pack type smaller long item. 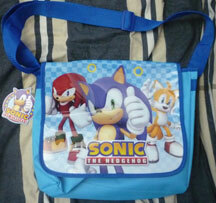 It has the Sonic logo on the front & features Robotnick chasing after running Sonic. The top to this is lavender to match the school bag, and has a red zipper. These MAY have had a dual release, both in the UK and in the USA. This bag, or a similar bag may have also been sold by itself/not on a value pack. The solution for squished sandwiches? A Sandwich Tin! This is a metal box about the size of a piece of bread. When you use a soft-sides lunch carrier, or even a regular lunch box, you can put your sandwich in here to keep it from being squished when packed/shaken around on the way to school or work. It also keeps it fresh & you don't use energy by throwing away tons of baggies. It's a pretty handy item. 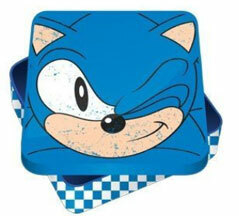 The square tin has close up/off the edges winking forward-facing classic Sonic for the lid & a blue/white checker pattern for the box base. Sadly, it also has "Faux Wear" or the purposeful design chipping to make it look 'vintage', but generally comes across a bit shabby instead. This is a 2016 item, but where could it be found?